Viral marketing was very good for Neil Blomkamp on “District 9.” So, no wonder he’s indulging in it again for something which apparently first showed up in some kind of newfangled i-something version of Wired Magazine. And now a brief clip from what seems certain to be one of the year’s biggest sensations and a very likely major Oscar contender, Darren Aronofsky’s “The Black Swan.” I’m really hoping this will be 50% Powell and Pressburger’s “The Red Shoes,” 50% Roman Polanski’s “Repulsion” and 50% something entirely new and original. H/t Movieline and the Playlist. Or at least that’s how I read the nominations that were announced this morning at the unholy hour of 5:38 by Anne Hathaway and some guy you never heard of — actually Academy president Tom Sherak. The short version of what happened was that there no huge surprises. “Avatar” and “The Hurt Locker” both got nine nominations, with “Inglourious Basterds” netting eight, and “Precious” and “Up in the Air” getting six apiece. You can see a complete list of the nominations courtesy of Indiewire/Eugene Hernandez, but Nikki Finke was kind enough to perform a handy count-up of the nominations. “Avatar” 9, “The Hurt Locker” 9, “Inglourious Basterds” 8, “Precious” 6, “Up in the Air” 6, “Up” 5, “District 9” 4, “Nine” 4, “Star Trek” 4, “Crazy Heart” 3, “An Education” 3, “The Princess and the Frog” 3, “The Young Victoria” 3, “The Blind Side” 2, “Fantastic Mr. Fox” 2, “The Imaginarium of Doctor Parnassus” 2, “Invictus” 2, “The Last Station” 2, “The Messenger” 2, “A Serious Man” 2, “Sherlock Holmes” 2, “The White Ribbon” 2. Without going into a lengthy dissertation on what makes for high quality Oscar bait, let’s just say that in many prior Oscar races the fact that “Avatar” is an effects driven space opera and “The Hurt Locker” a rather grim, eye-level, and uncompromising look at men doing an unpleasant job, would have all but eliminated both films. Admittedly, both films, however, benefit from certain features which have helped numerous other films: a certain degree of social consciousness never hurts with Oscar. Of course, really strong political statements are more problematic, but “The Hurt Locker” is simply honest about the psychological effects of war and hard to argue with from any political position, I hope — it could have been made about any war and been equally valid. “Avatar” is considerably more pointed and arguably even partisan, as our conservative friends love to point out, but the protective coloration of science fiction makes it all go down a bit easier. As for “Inglourious Basterds,” Quentin Tarantino‘s entire body of work is a poke in the eye to the earnest, highly digestible “socially positive” values and traditionalist presentation preferred by Oscar. The fact that he even gets nominated as much as he does is testament to his unquestionable talent and appeal. “Up in the Air,” which beat “Basterds” in the screenplay category at the Golden Globes, seems like much more like the kind of film that Oscar traditionally favors. It’s non-polarizing nature might also help it with this year’s odd voting system for Best Picture. (Voters rate the films by preference, rather than simply voting for one film.) Still, with ten nominations breaking up the usual demographic voting blocks — with younger voters and older voters sometimes having very different views of the award-worthy nature of genre films, for example — I really think that about half of the films in this category have a pretty serious shot at winning the award. Among the dark horses — the films I would be truly surprised to see win best picture — we have the very non-Oscar-baity “A Serious Man” which apparently beat out Tom Ford’s highly acclaimed “A Single Man” in the divisive sub-sub-sub category of minority-group driven movies whose title is “A (S-word) Man.” The Coen Brothers film is a scabrous comedy and also grim in a not obviously socially redeeming way. Disney/Pixar’s “Up” and Neil Blomkamp’s science-fiction “District 9” are similar to “Avatar” in that they would be more Oscar friendly for certain of their elements (poignant comedy/smart political parable) if they were in non-animated and/or non-sci-fi but, unlike “Avatar,” they haven’t been sweeping up awards anyway. 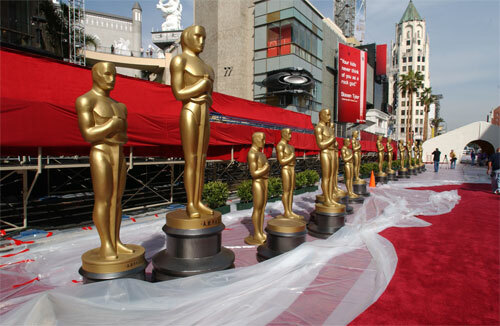 Oddly enough, the two most traditionally Oscar-friendly films on the list, “The Blind Side” and “An Education,” are both fairly large dark horses in most categories simply because they haven’t won that many awards up to now, the exception being best actress where Sandra Bullock seems to be running neck and neck for Best Actress with Meryl Streep in “Julie and Julia.” “An Education” and “A Serious Man” have the further downside in what I see as fairly ridiculous charges of antisemitism against both films (covered really nicely in this piece from The Jewish Journal). As a person of Jewish ethnicity myself, I think people who feel this way are really missing the point. Still, some of them may be Academy voters. It’s the very last day of the aughts, the noughties, or the 2000s, whichever term you prefer, and there’s some movie news to pass along. * It’s a funny day to have a stockholders meeting, but that’s appears to be what Marvel Entertainment did and, yes, they approved the widely heralded Disney merger. Russ Fischer at /film has the details. * With, as far as I can see, no major wide releases or, as I far as I can tell, even large expansions to talk about and not much other information available, I’m dispensing with this week’s box office preview. However, Jolly Carl DiOrio is here to tell us that this weekend is going to look a little something like last weekend. * Speaking of box office, I’m not sure this is exactly news, but, get this, “Avatar” is doing really well — it just passed the $800 million mark worldwide — and looks likely to continue to do extremely well for quite a long time. Even the busiest man in the world apparently couldn’t wait to see it in the White House movie theater (I wonder if it can show digital 3-D?) Also note that eight year-old Sacha and 11 year-old Malia were allowed to see it even though it has a PG-13 rating . Expect this to be discussed at length on the Sunday shows. * I had to update yesterday’s post to correct this. Apparently, The Weinstein Company is going to leave “Nine” in the roughly 1,400 theaters it’s in, despite last week’s poor showing. * It’s now “Sir Captain Picard” to you. Alongside Patrick Stewart, film and theater director Nicolas Hytner (“The Madness of King George”) just got an excuse to be extra snooty. * Neil Blomkamp of “District 9” wants to make original films that aren’t based on older franchises and, so, has said he’ll stay away from large budgets. He’s not dumb.